The Quebec government has announced its plans to adopt Bill 70—a piece of legislation that would force new welfare applicants to register for employment training or have their welfare cheques cut by $200. The government justifies this plan with the language of debt reduction. Currently, the welfare system administers cheques of $623 a month. This is barely a living. Despite this, the government continues to push for the welfare recipients to earn this measly sum, when they might not have the means to do so. Instead of advocating this bill, the government should be reminded of the fundamental reason the welfare system was put in place. Welfare is not a luxury that can be taken away when recipients do not comply with unjust rules. People on welfare are vulnerable and need financial help and stability. This bill ultimately perpetuates that precariousness. More than two-thirds of new applicants to welfare voluntarily participate in employment programs. The other third that doesn’t participate has various reasons for not complying—they could be in crisis, escaping a violent situation, or dealing with eviction and even homelessness. In fact, there are 3,016 homeless people in Montreal, according to city’s first official homelessness census released in July 2015. Bill 70 will put applicants’ backs to the wall. They will not have enough money for rent and basic needs. They could end up on the street. Carol Taylor, a woman currently on welfare, remembers when she signed up for the program a few years ago. She said she was in a bad situation. If she was forced to sign up for a job-training program, she says she would feel “scared and pushed,” especially in the mental state she was in at that time. Ultimately, it would have made her situation worse than it already was and pushed her off the edge. Benoit Langevin, the executive director of West Island Youth Action, shares Taylor’s concerns. The organization works with youth in difficult situations—be it economic, familial, or psychological—and provides them with the resources they need. He says that on the West Island, seven per cent of people are on welfare. Of those, the majority are between 15 and 35 and Bill 70 could make their situations even worse. If someone can’t find a place to stay, or a place to eat, how will they force themselves to go to an employment centre to sign a document? “It just makes another red tape for people in need,” Langevin said. He explained that the government could have done something great with this employment program—especially with the large amount of people looking for work. Instead, he says the government is using coercion. Proponents of the bill claim it will save the provincial government $50 million per year. Langevin said that is “ridiculous.” We should have invested money in order to get rid of our debt, he said, rather taking from the poor and punishing the ones who are already feeling punished. “I find it immoral,” he said. Langevin said we should have approached the welfare system in the opposite way. He believes that the government should instill a bonus system instead—when one looks for a job, signs up for the job training program or finds a job, they should be rewarded. This method has previously been proposed by various community organizations. He continues that the welfare system perpetuates poverty, which creates a “race to the bottom,” and releases the pressure on wages. This, of course, benefits businesses, but harms the poor and society in general. In the article, Sangha proposes a way to “fix” the system: by simply requiring potential welfare applicants to apply online, receive their funds through direct deposit, and get their bank statements through email, they would consequently become computer literate. This would increase their know-how, and give them more of an edge with potential employers. In an email Sangha denounced Bill 70. He said he supports a guaranteed annual income for all Canadians with no restrictions. To him, people should not be forced into anything, including job training. Low paying jobs usually keep people trapped into poverty, Sangha said. 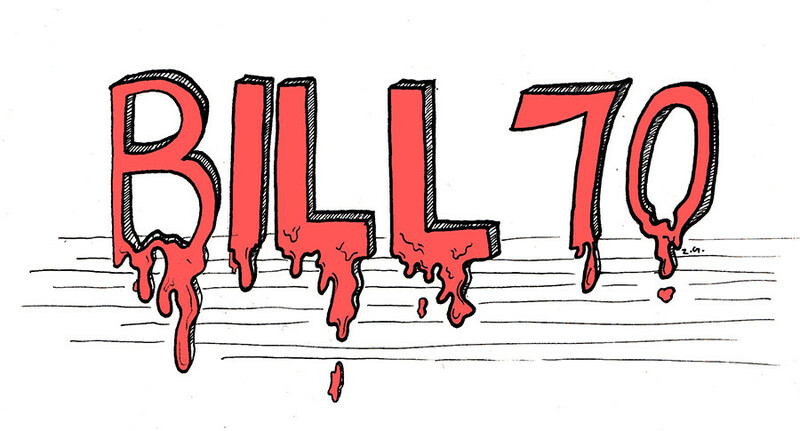 Bill 70 is degrading and perpetually stigmatizes the welfare system. Targeting the poor in order to alleviate Quebec’s debt is a low move and is not what Canada stands for. Canada is a welfare state. We offer social services, including the provision of minimum income and the reduction of economic insecurity due to sickness, old age and unemployment. Bill 70 goes against those values. Instead of attacking people who are already marginalized, the government could tax the rich, invest more money, or give the welfare form a reward system, which would encourage people to find jobs instead of threatening them into it. People should be provided with sufficient means to pursue their full potential and life passions. Giving them a monthly wage, when in immense need, would help them with that. Although it is not much, the extra support is crucial. “Who knows how many future Nobel Prize winners never reached their potential because they were forced to take some crappy minimum wage job?” Sangha said.